Glass artist Michelle Pennington spins and shapes glass while fellow artist Alexa Adamczyk blows into the other end of the pipe. The pair did not know each other before this summer, but both signed up to perform at 10 fairs this summer on behalf of Mobile Glass Studios. 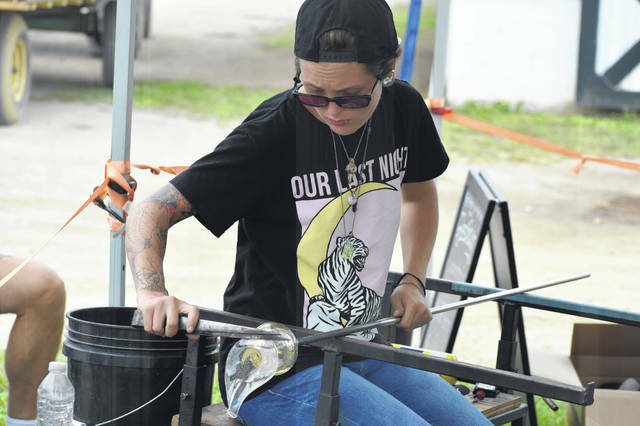 Glass artist Alexa Adamczyk shapes a vase Monday afternoon at the Delaware County Fair. Adamczyk and fellow glass artist Michelle Pennington, came to the fair on Saturday and have done six-hour demonstrations each day. During their demonstrations, the pair answer questions from the crowd and explain how glass blowing works. Though they are seated only feet away from the furnace burning at 2,100 degrees, glass artists Alexa Adamczyk and Michelle Pennington say they’ve acclimated to the heat and aren’t bothered by it. 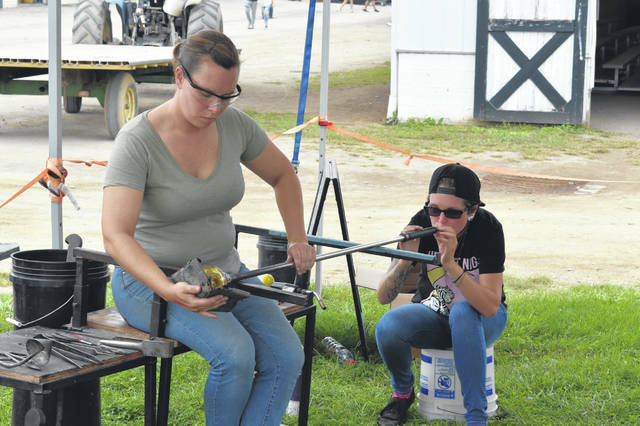 Adamczyk and Pennington have been doing glass blowing demonstrations since the Delaware County Fair began on Saturday, and both said they’ve enjoyed the fair. “It’s a nice one,” Pennington said. She added the Delaware County Fair is the 10th consecutive fair that she and Adamczyk have performed at across Ohio and Pennsylvania. The pair performed demonstrations from 1 to 7 p.m. during their three days at the fair and also had several previous creations for sale. During their demonstrations, the pair works together on a piece with one person blowing and the other shaping the glass on the other end of the pipe. The duo said they also take turns or work at the same time on different pieces. Pennington said she teaches glass blowing and wanted a break over the summer, so she signed up to tour with Adamczyk, even though she didn’t know her beforehand. “It’s worked out for us,” Pennington said. Adamczyk said she has been doing glass blowing for about two years and studied in school before dropping out to do glass blowing full-time. During their demonstrations at the fair, Adamczyk and Pennington answer questions from the crowd about glass blowing, which is one of Adamczyk favorite things about the job. Adamczyk said she wants to return to school and eventually do art therapy with at-risk teens or victims of abuse. Pennington said the fair will be the last one for her and Adamczyk. While she’s enjoyed the experience, Pennington added she doesn’t think she’ll be doing it again because it was very tiring. “It’s an hour of setup and six hours of blowing glass spread out throughout the day,” Pennington said. Pennington added she’s planning on co-opening an art school in Louisiana after she returns home.